The best way to a healthy body is to include plenty of fruits in your diet. Everyday consumption of these tasty fruits can prove to be beneficial for our body in many ways. Fruits, just like vegetables, are a superb source of vitamins, enzymes and minerals. If you want to eat a healthy diet which can help you lose weight, or gain more energy, then it is advisable to start your day with high intake of fruits, whole grains and vegetables. 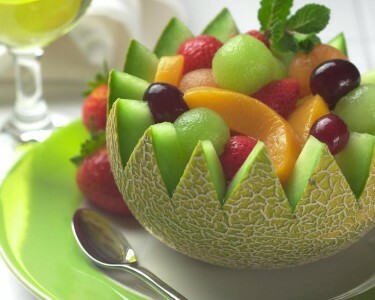 Eating fruits regularly will make you realize how fresh and energetic you feel. Fruits, just like vegetables, are a superb source of vitamins, enzymes and minerals. They can easily be digested and have a cleaning effect on the digestive tract and blood. They consist of less percentage of fats and proteins, higher percentage of water and beneficial alkaline properties. Drinking lots of water is a general knowledge that everybody should have. However, it is not always possible for a person to drink six to eight glasses of water daily. But, most people are unaware of the fact that fruits contain 80 percent of water. Therefore, to increase the water intake you should add lots of fruits to your regular diet. By eating plenty of fruits, digestive problems like diarrhea, constipation and abdominal cramps, can be cured. Bowel movements can be regularized by eating fruits that contain natural fiber while some fruits also prove to be effective when it comes to reducing cholesterol levels. Heart diseases and stroke can also be prevented by consuming fruits every day. It is said that a person who eats fruits everyday has a sharp memory as compared to those who do not take much interest in eating fruits. Various researches conducted in the field have proven that fruits can actually sharpen your memory. Along with fresh fruits, dry fruits like prunes, figs and raisins also prove to be extremely beneficial. The best form of eating fruits is when they are in their raw or ripe state. We should avoid cooking fruits, as they tend to lose their carbohydrate, salt and nutrient contents. We should never forget the fact that on this planet fruits are the most natural foods. In case of illness, a person should consume fruits in the form of juices. Eating fruits should be mandatory for people who are sick or on medication. Hence, regular intake of fruits will help you maintain your health and fitness. Fruits help you in prevention of diseases, improve your memory and at the same time provide your body with the necessary amount of water. So, start eating fruits by making it a part of your daily diet. You will look fresh and feel healthy.